More photos from the rally outside the bank are available by clicking the image to the left. LEXINGTON, KY—At least 40 concerned citizens rallied in downtown Lexington today to express their anger at PNC Bank for financing mountaintop removal (MTR) coal mining. Local activists were joined by members of the group Mountain Justice and residents from mountaintop communities, who spoke out about the direct impact that this destructive form of mining has on their community, health and environment. “Several banks have realized that they shouldn’t be involved with companies that are causing the total annihilation of a culture by their use of MTR. It’s unfortunate that PNC, like Massey, is putting profits over people and over God’s creation,” said Mickey McCoy, a Martin County resident whose community was affected by a coal sludge spill in 2000. Also present at the protest were a colorful street-theater troupe of ‘clowns,’ who acted out a performance of a coal company blasting the top off a mountain, then extracting a bag of money and passing it between U.S. Banks like a hot potato, to symbolize PNC Bank doing business with companies that other banks have moved away from. 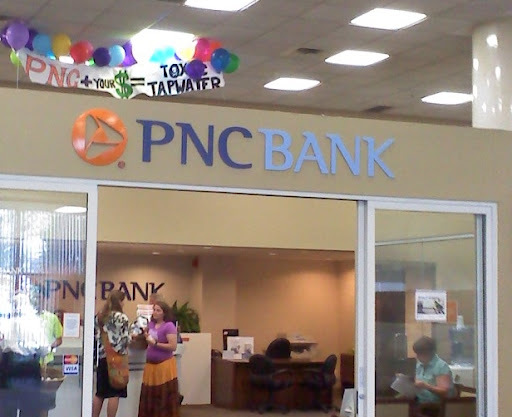 The protesters paid a visit to the PNC branch at Main and Deweese streets and released a banner inside attached to some helium balloons, which said “PNC + Your Money = Toxic Tap Water.” Activists also passed out literature about the issue to bank customers and employees and delivered a letter to the bank branch manager asking that PNC end their financing of mountaintop removal. “PNC Bank was a recipient of bailout funds, so their investments in MTR represent my tax dollars. I am vehemently opposed to the destruction of the mountains, forests and communities of Appalachia, and I’m concerned by the impacts of strip mining on water quality in central Kentucky,” said Martin Mudd, a Lexington resident and activist with Kentucky Mountain Justice. Since January 2008, PNC has become the number one U.S. financier of mountaintop removal coal mining. The bank has provided more than $500 million in loans and bonds to six companies practicing mountaintop removal: Massey Energy, Patriot Coal, Alpha Natural Resources, International Coal Group, Arch Coal and Consol Energy (Source: Bloomberg). These six companies are collectively responsible for almost half of all mountaintop removal coal mining in Appalachia. “The idea of corporate responsibility has come up repeatedly in recent weeks following the coal mine and oil disasters. That responsibility extends beyond profits to the health and wellbeing of our communities. Some banks, such as Bank of America and Wells Fargo have made commitments to reduce and even end their funding of the dirtiest coal mining practices. By continuing to finance mountaintop removal coal mining PNC is throwing that responsibility aside,” said Amanda Starbuck of Rainforest Action Network, who is campaigning for banks to end their investments in the sector and shift their support to clean, renewable energy and green job creation. PNC recently ranked bottom in a score-card report on MTR financing by Rainforest Action network and the Sierra Club. The bank earned an “F” for its total failure to take environmental risks into account in its lending practices. Mountaintop removal mining is a devastating form of mining where companies blow the tops off mountains to reach a thin seam of coal and then dump the waste rock into valleys below. This destructive practice has buried nearly 2,000 miles of streams and threatens to destroy 1.4 million acres of land by 2020. The mining destroys Appalachian communities, the health of coalfield residents and any hope for positive economic growth. justice activists young and old so this action will be a lot of fun. Mountain Justice Summer training camp 2010! As the campaign to stop all forms of surface mining gains national awareness, we have more and more opportunities for folks to devote a summer of work to stopping mountaintop removal. We’ve got a job for every interest, skill set and time commitment! Don’t worry if you can’t volunteer all summer long, there are plenty of ways you can continue working with us in your hometown throughout the year! Join us for ten days spent cultivating the skills and visions needed to abolish mountaintop removal and build vibrant, healthy, self-reliant communities. Camp is a time for training, strategizing, bonding, service and action for veteran and novice activists, for people living both within and outside of the coalfields, for women and men, for people of all races, for youth and elders, and anyone in between. Realizing that we ought to model independence from coal, camp will be off the grid this year! We’re so excited to be off the grid, but for Mountain Justice, a sustainable community is more than some solar panels and rainwater barrels. It’s about the people that defend what they love, the people who work to create sustainable communities, and the nourishing relationships between them. Our focus on sustainability will mean building a strong and diverse organizing community that works on both resistance and solutions. Trainings will be collaborative as possible, so come open minded and willing to actively participate—this is a collective movement! If you want to facilitate a workshop, please let us know! Our hope is to continue to build a broad community to sustain, guide and nourish us as we all continue working to abolish surface mining and rebuild economically self-sufficient communities in Appalachia. No community is sustainable without fun, dancing, bonfires and Appalachian mountain music! So bring your instruments, dancing shoes and high spirits, we’ll be celebrating the ways of life we’re fighting to preserve! May 18, 2010: Human Life is Worth More Than a Lump of Coal! Tuesday, May 18th, 8:30 a.m. – 12 or 1 p.m.
On April 5th, 2010 a massive underground explosion occurred in the Upper Big Branch coal mine in Raleigh County, West Virginia. 29 miners were killed in the explosion, making this the worst U.S. coal-mining disaster in 40 years. The UBB mine is operated by Performance Coal, a subsidiary of Massey Energy, the Richmond, Virginia based company whose CEO Don Blankenship is notorious for prioritizing coal production over the health and safety of miners and local communities. In addition to the company’s ample safety violations, Massey has also fallen under scrutiny for its practice of Mountaintop Removal coal mining, in which the tops of mountains are clear cut and then blasted with explosives, the coal is extracted and the remaining earth is pushed into the valleys below, burying the headwaters for major river systems. Enough is enough. Join Mountain Justice and allies as we call for the resignation of Donald Blankenship and support stock holders efforts to have him resign! Our struggle for environmental justice in Appalachia has never been as publicized, analyzed, or urgent as RIGHT NOW! Not a moment too soon, your chance to plug in and make things happen is here! This March 12 – 20, Mountain Justice Spring Break will bring hundreds of young people face to face with the impacts of mountaintop removal and coal industry abuse- and give you the skills and knowledge you need to fight back! Through education, community service, speakers, hiking, music, poetry, direct action and more, you will learn from and stand with Appalachian communities in the struggle to maintain our land and culture. This spring break will be like no other! With skill building and analysis sessions ranging from critical organizing to non violent direct action, you will leave camp with the training you need to not only make things happen in your community, but train others to do it as well! And since it is a “break” we will find plenty of time between rabble rousing to relax, reflect, and have a great time with each other, whether hula hooping, playing music, or cuddling in a hammock! Please share your spring break with us in the breathtaking southwest Virginia coalfields, March 14 – 20, cultivating the skills and visions needed to abolish mountaintop removal and replace it with vibrant, healthy, self-reliant communities. Come and bring your friends! We are committed to learning a lot, getting involved in ending mountaintop removal, and having tons of fun! WHO? Mountain Justice participants come from diverse backgrounds such as coal field residents, college students, environmentalists, Earth First!ers, and other concerned citizens that care about our mountains. Participants share a common goal to halt MTR and destructive coal mining. Learn all about MTR and Mountain Justice at www.mountainjustice.org, AND find out about Mountain Justice SUMMER Action Camp May 27th – June 6th on Pine Mountain in Kentucky! CAN’T WAIT? The MJSB planning collective is looking for Campus Coordinators who can organize a crew of people from your school or community. You (yes, YOU) are strongly encouraged to let us hook you up with a coordinator resource packet to help you start fueling this movement TODAY! Pettus, W.Va.– Three occupied Massey Energy subsidiary Marfork Coal Company, Inc.’s main office this morning at eight. The protestors plan to present a citizen’s arrest warrant and list of violations on the Marfork processing plant, Bee Tree Surface Mine and Brushy Fork sludge impoundment to company president Christopher Blanchard and Massey CEO Don Blankenship. The above image shows two areas, in purple, where Massey Energy is blasting dangerously close to the Brushy Fork Impoundment and multiple gas wells. The tree sit was right next to the #2 Haul Road. Click the image for a larger version. Marfork Coal Co. has started work on the Bee Tree Surface Mine, and is blasting within 1,000 feet of the impoundment. The blasting threatens to decrease the stability of the Brushy Fork dam, which sits above a honeycomb of abandoned underground mines. Just last week, the W. Va. Department of Environmental Protection issued a violation on the impoundment for failing to meet an engineering safety factor. This measurement determines how much force a structure can withstand beyond the amount that is expected to be exerted upon it. At the time of the issuance, the dam could withstand thirty percent additional force, rather than the fifty percent mandated by law. The WVDEP was acting under a ten-day notice issued to them by the federal Office of Surface Mining. If the Brushy Fork impoundment breaks, a 38.49-foot wall of water will arrive in Sylvester, a town 4.8 miles downriver, within 36 minutes. By Massey Energy’s own estimates, the disaster would kill 998 people. “I won’t stop breaking the law until they do,” said Mike Roselle, who along with Hamsher and Tom Smyth, intends to stay in the office until Marfork Coal Co. suspends blasting operations. To date, the practice of mountain top removal coal mining has leveled more than 800 square miles of mountains across Appalachia, destroyed over 2,000 miles of freshwater streams, and poisoned and displaced countless communities that call the mountains home. Each working day, 3,000,000 pounds of explosives are used against the mountains of West Virginia alone. It is time to end this tragedy. On March 1st, join Mountain Justice and other allies as we demand that the EPA do their job to protect the land, water, and livelihoods of Appalachian coalfields residents. EPA’s Region 4 office in Atlanta has the power to stop granting new mountain top removal mining permits, and the EPA nationally has the power to ban this devastating practice forever. They need to hear from us! Help shine a spotlight on the central role that our regional decision-makers play in perpetuating the practice of mountain top removal. Come out on March 1st and show your support for the mountains and communities of Appalachia! For more information call 828-280-3462. The U.S. Environmental Protection Agency is preparing a new rule to regulate the disposal of toxic coal ash – the byproduct of burning coal for power. As expected, the coal industry is fighting to maintain the status quo on coal ash, backing a proposal that limits opportunities for public input and ensures coal ash is treated less responsibly than household trash. The nearly 130 million tons of coal ash generated each year is full of harmful toxins like arsenic, lead and mercury. People living near the coal ash sites have a staggering 1 in 50 risk of cancer. Both the EPA and the National Academy of Sciences have years of research making it clear that coal ash is becoming increasingly toxic and confirming time and again that coal ash poses a threat to human health. EPA must treat coal waste as a hazardous substance and ensure that residents of communities impacted by coal ash disposal can provide input on how the coal ash should be handled. We must generate thousands of emails and phone calls to the White House, Office of Management and Budget (OMB), the US EPA and Congressional Offices telling them coal ash is hazardous and federal regulations are needed immediately. There is no more time for delay! Coal-fired power producers, US Senators and Congressman, Governors, and federal and state agencies are pressuring the White House and OMB to derail the US EPA’s attempts to reportedly establish national disposal standards to protect water supplies and communities from toxic coal combustion wastes, or coal ash. Polluters have already met with OMB and other White House officials at least 21 times in advance of the US EPA’s proposed coal ash rules! Polluters are trying to prevent the public from having a chance to see and comment on the proposed rules. The time has come to tell the Obama administration the public should be allowed to see and comment on these rules! They need to know we want and support hazardous waste rules that protect our health and environment from coal ash. We want President Obama to uphold his promise of allowing science to dictate policy: federal agencies must allow the US EPA to do its job to protect our water from the irresponsible dumping of coal ash – dumping that has been allowed by states for decades. Whether it’s a public health threat, an environmental justice issue, a threat to species or public safety, coal ash is bad news for millions of Americans. Tell the White House and EPA how coal ash is a threat in your region and your neighborhood. LEXINGTON, Ky: Tuesday, an anonymous group of students from the University of Kentucky hung a banner from a parking structure near Rose Street to protest the university’s use of coal power on campus. The banner, reading “COAL: A Tradition of Oppression. STUDENTS: Let’s Change Our Legacy”, included a reproduction of the familiar UK symbol, with a burning smokestack between the letters instead of the usual Memorial Hall steeple. The students’ use of the word “oppression” alludes to the detrimental effects of coal not only on the environment, but on the miners and communities in coal-mining regions of the state. An estimated 12,000 coal miners have died from black lung in the past decade, and their families are equally affected. The real tragedy, though, lies in mountain top removal (MTR) coal mining, a practice that more and more coal companies are using to extract coal at a lower cost. MTR employs explosives to decapitate mountains, and the leftover waste is deposited in surrounding valleys. The chemicals and residue bury and contaminate freshwater streams, thus poisoning the water supply for surrounding communities and devastating local ecosystems. While the university, directly, does not deal in MTR coal, Kentucky Utilities provides a significant portion of the campus’s power, and is a known distributor of energy derived from the controversial method. “The University of Kentucky is the flagship university of the state, and as such, sets the example for the rest of Kentucky. Any change we can make toward cleaner energy and the diversification of jobs and economies will affect the entire Appalachian region drastically, and for the better. This change is one that can’t wait,” said an Appalachian Studies junior. It seems momentum has not died from the announcement last semester that the new Wildcat Coal Lodge would be endorsed by the coal industry. Tuesday’s banner was one of a series that has hung on campus since October, indicating that the students have not forgotten President Todd’s decision, and that they still worry for the future of their school’s energy and integrity.